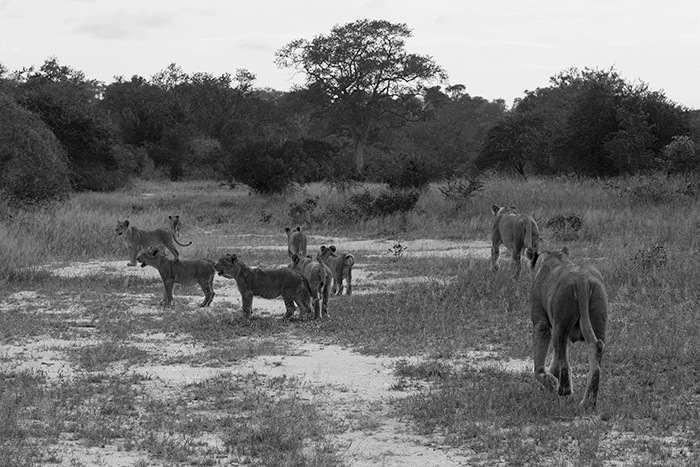 Whilst two of the lionesses from the Sparta Pride were off unsuccessfully hunting giraffe in the thickets around the Maxabeni drainage, the seven cubs decided that they would try their own luck at a hunt. 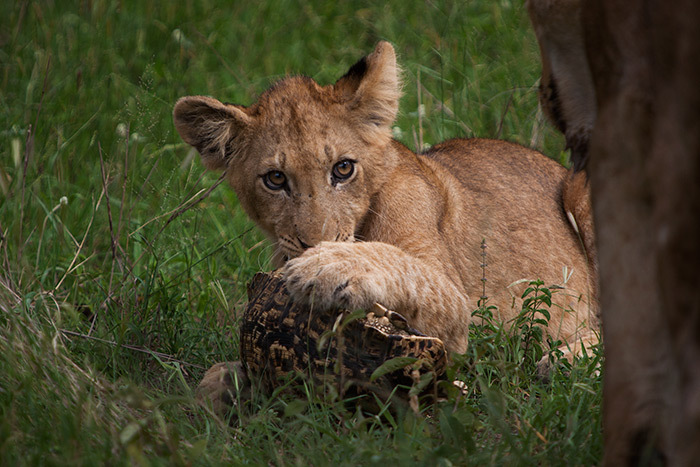 The target of their skirmish: a large Leopard Tortoise. A few days ago we were fortunate enough to witness the unusual behaviour of a Nile Crocodile catching and killing a Leopard Tortoise. Although not as unusual as that, this sighting sure did provide some entertainment! Unless of course you are a poor Leopard Tortoise…in which case you will be tired of being the focus of Londolozi’s blog posts. 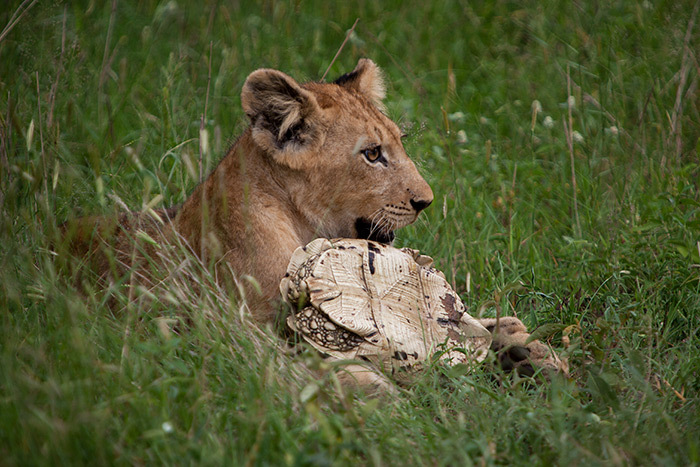 Priceless – The seven cubs and one lioness all huddled up and drinking at the same time. Immediately after this drink one of the youngsters saw the slow moving figure of a tortoise up ahead. In a flash he was bounding across the clearing and was upon the unsuspecting reptile. Instinct took over and the tortoise drew into his shell. He had no option but to sit it out as each cub took their turn at trying to prize him out of his home. 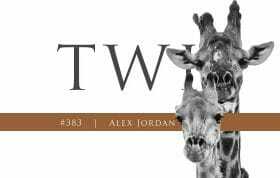 If left up side down would the tortoise be able to flip over? I am not sure Leslie…I wander this myself? More than likely it would not be able to. Its not impossible but normally they have a very hard time. Fantastic pictures, Adam! 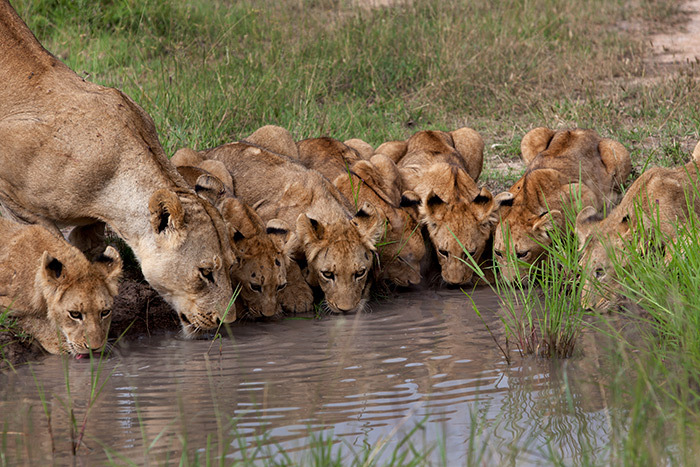 – especially the 7 cubs and lionness drinking together. Hope to see them when we return to Founders in mid-February – not long now, and can’t wait! What’s the Male-Female make up of the cubs? Thanks Adam! Such fun pics! Are all the cubs female? If so the Sparta pride will finally be very big. As far as I know there are six male cubs and one female. Maybe Adam could confirm? 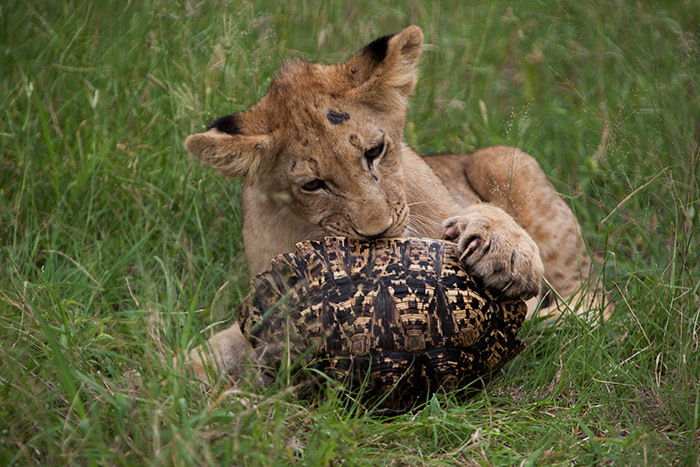 Love the cubs trying to get the tortoise and the lions drinking together! First, they are too chicken to attack the Guinea Fowl and now they can’t get the tortoise! 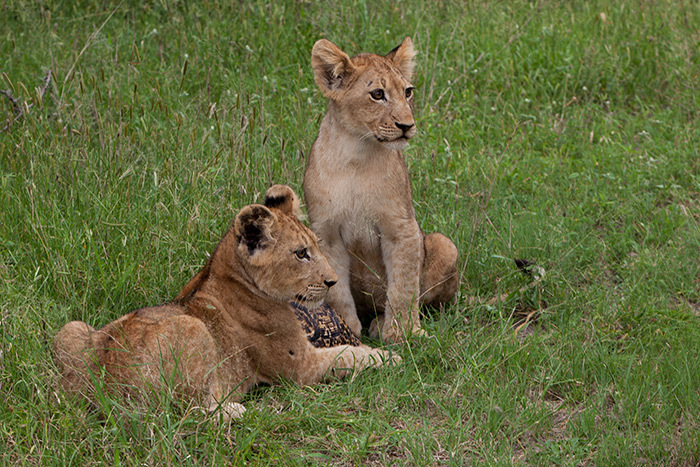 We miss Londolozi already! 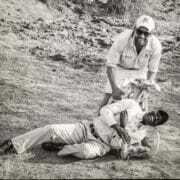 the mapogos for so long i hope pb and mak still staying out of trouble,well done majis they have done well.